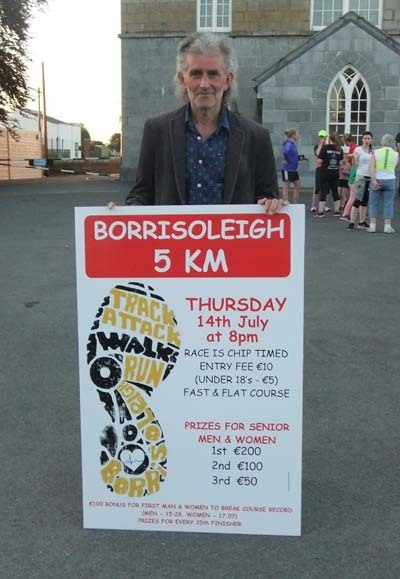 This year’s Borrisoleigh Festival takes place on Sunday July 17th. There is a packed day of activities with something for all the family. The day kicks off with a ‘Bush n Briar’ walk, registration is in the Community Centre, beside the Church, from 8.30am leaving at 9am sharp. Car pooling to the starting point. 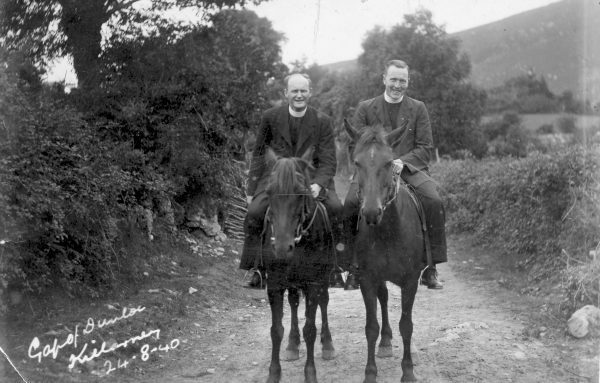 Latteragh to Knockanora with a twist. 12K walk. Walking boots essential. There is live music with local musicians on the square after Mass. 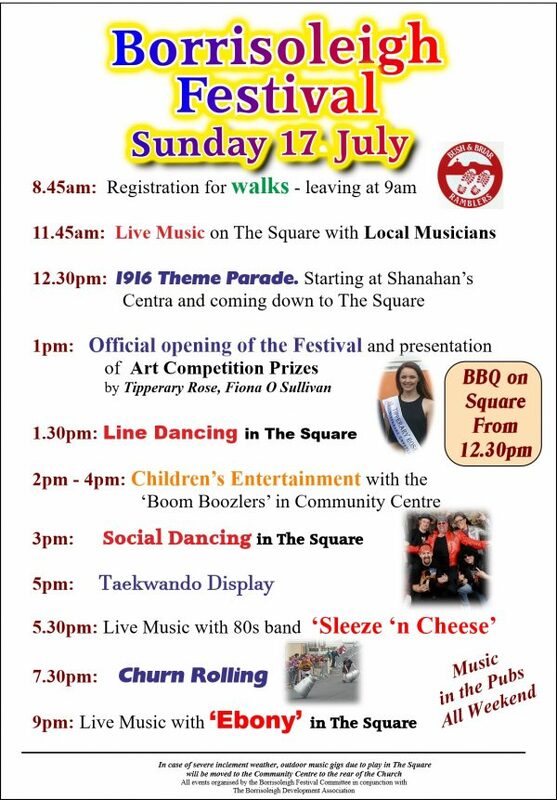 At 12.30 there is 1916 themed parade through the town, starting from Shanahan’s Centra down to McDonagh Square. After the opening ceremony at 1pm, the current Tipperary Rose and presenter of Tipperary County Matters on Irish TV, Fiona O Sullivan, will be presenting the prizes to the winners of the Children’s Art Competition. Fiona will be interviewed by our Lord Mayoress, Patrice Cooney. This is followed by Line Dancing with Suzanne at 1.30pm. Social Dancing is with Phil Maher and The Castle Trio at 3pm in the Square also. The Boom Boozlers group will entertain children from 2pm to 4pm in the Community Centre. The Taekwando group will put on an exhibition at 5pm in the Square. There is a treat in store for 80s rock lovers as ‘Sleaze n Cheese’, an 80’s rock experience featuring hits from Bon Jovi, Guns N Roses, Journey, Van Halen, ZZ Top and many many more will play from 5.30pm -7.30pm. After you’ve rocked your socks off, the extremely popular Churn Rolling returns for a second year to Borrisoleigh Festival. Participants from The All Ireland Churn Rolling competition taking place in Tipperary Town the previous day will on hand to display their talents. To take part in the churn rolling you will have to have completed training. Keep an eye on our Facebook page for details of training sessions. The day will be concluded with music in the Square from 9pm by the wonderful group Ebony, who are renowned for their musical talents and getting the crowd going. Gt ready to dance the night away! Be sure to come along for a great days entertainment. Keep up to date with all events on the Borrisoleigh Festival Facebook page and make sure and pick up a copy of the Festival booklet in local shops. Thanks to all the sponsors who supported Borrisoleigh Festival please support them as best you can. Read the booklet online below. 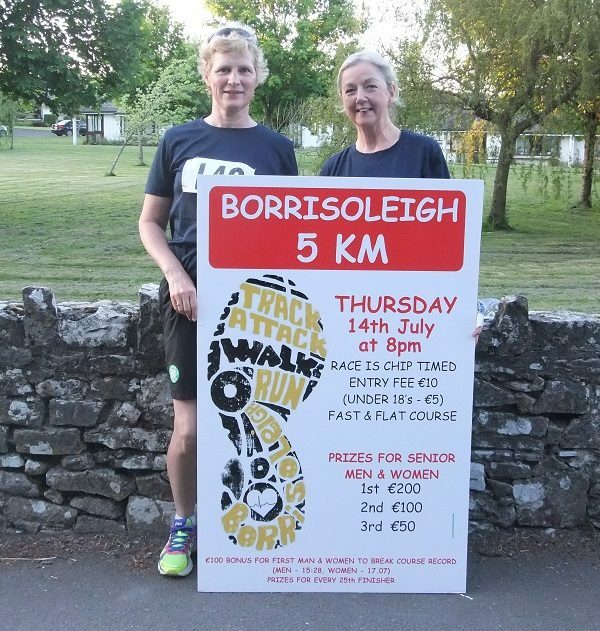 The date for the third annual Borrisoleigh 5km has arrived and hopefully tomorrow (Thursday) night will see a big crowd gather to participate in the growing event. On a course that is ideal for having a go at achieving a Personal Best time, we should be guaranteed an excellent standard of running right throughout the field. 8pm is the start time with entries being taken at the Parish Centre (behind the church) from 6:15pm onwards. The event is chip timed and the entry fee is €10 for adults and €5 for under 18’s. For those competing for overall honours, there are excellent prizes on offer with the winning man and woman each receiving €200. On top of that they have the chance of adding to that by breaking the course record. If the winning athletes can break 15:28 (men) and 17:07 (women), they will add another €100 to their takings. Second place on the night will receive €100 while the third man and woman to cross the finish line will each receive €50. We also have a prize for every 25th finisher while the first man and woman in each of the over 490, 50 and 60 grades will also receive a prize. The competitions amongst the Track-Attackers should be interesting as many are set to peak and set new PB’s for the event. Prizes are on offer to the first 3 men and women for Track-Attack members while this year we also have prizes for our underage members. Tea and refreshments will be served in the Parish Centre afterwards where all participants will be treated to ice-cream for their efforts!!! It doesn’t matter if you run, jog or walk, all are welcome and encouraged to participate. 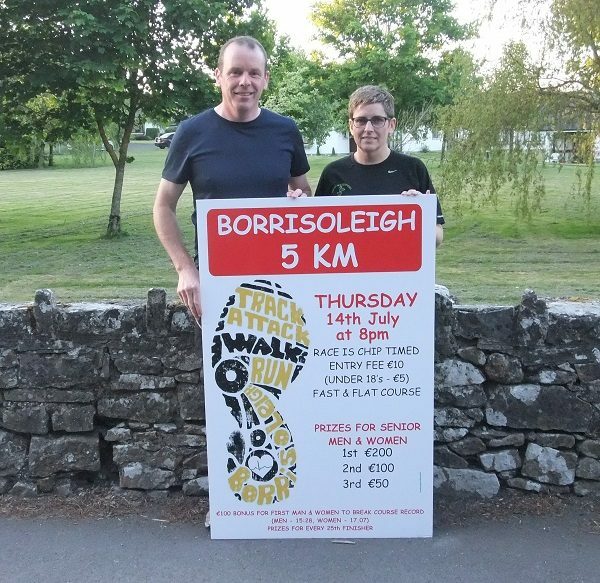 Get yourself to Borrisoleigh tomorrow night and bring a friend with you……………………………. U16’s started the Summer League and played Kildangan last Tuesday. 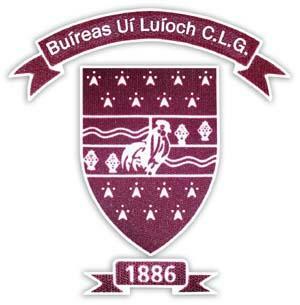 Result: Borris-Ileigh 4-06 Kildangan 3-06. Scores from: Kate Delaney 3-03, Emma Doolan 1-00, Sinead Ryan 0-02 & Katie Boyle 0-01. Fantastic win girls. U13‘s had another great win against Rockwell Rovers last Thursday. Final score, Borris-Ileigh 8-03 to Rockwell Rovers 1-01. Scores from Emma Doolan 1-02, Chloe Carroll 3-00, Katie Fitzgerald 1-00, Dani Ryan 3-00 and Kelly Healy 0-01. Well done girls. This team are now through to a County Quarter Final to be played in Borrisoleigh next Friday July15th. Further details by text. 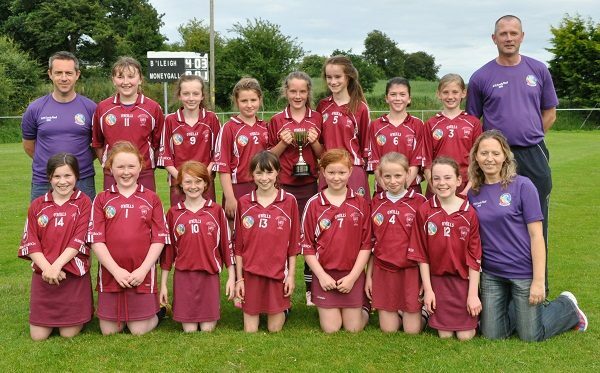 Our U12 County final winners, defeating Moneygall 4-03 to 0-01 on July 5th at the Camogie Grounds, The Ragg. 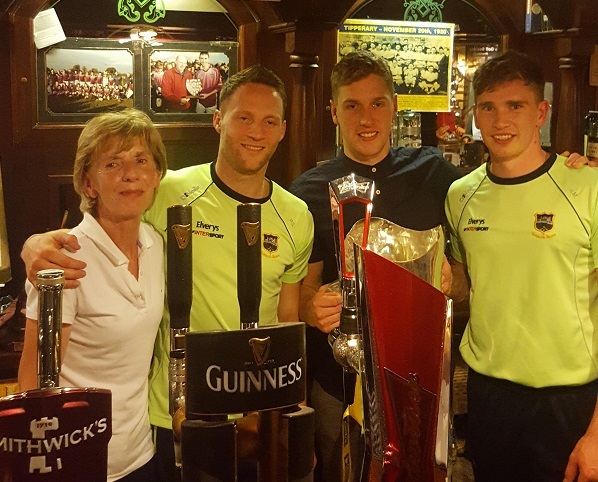 Our winners celebrated in style, and returned home to Borrisoleigh, with flags flying and celebrations galore. After running a lap of honour at the town park, they retreated to the Community Centre, for deserved refreshments, speeches and photos. This is a fantastic achievement, and is the first time since the restoration of the current club, that we have won a county final at juvenile level. Hopefully there will be many more to come. Great credit it due to the management team of Mike Galvin, Martin Hayes & Sarah Galvin. To add to already a great week, this team participated in a blitz morning last Saturday, where they had a win over Drom, and a draw against Thurles. Well done girls. 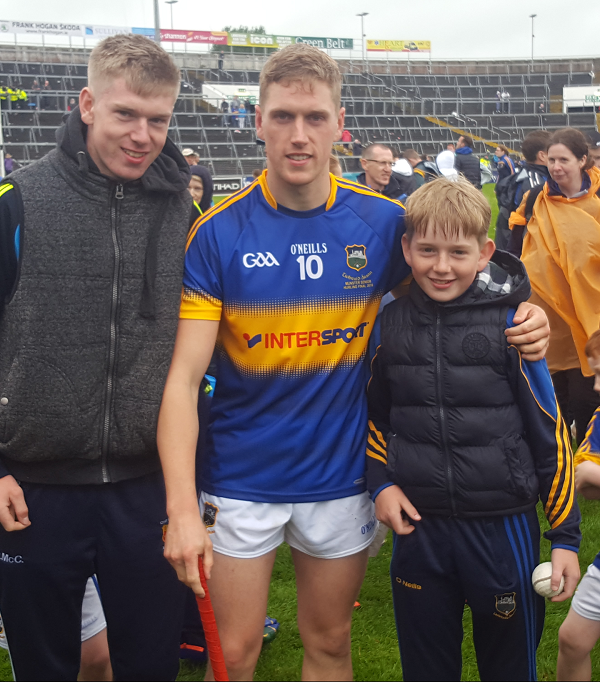 Inter-County: A massive well done to all involved with Tipperary over the weekend. 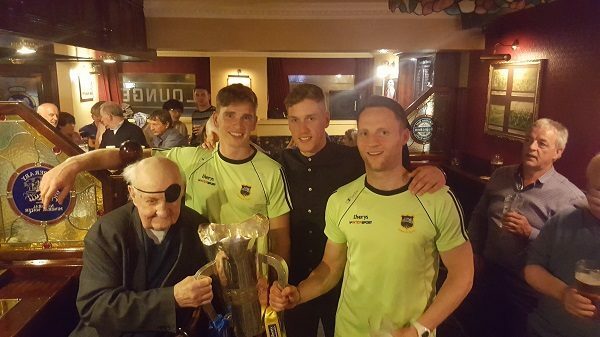 In a fantastic display of attacking hurling we were delighted to see Brendan Maher lift the Munster cup once again. Well done to Brendan, Dan, Paddy and Conor. There was further silverware going back to Borris with Jerry Kelly picking up his first munster medal after they defeated Limerick. Fixtures: We will play Kilruane in our North Quarter Final on Sunday July 31st in Dolla at 7.30.